"Last week I decided to take it off to clean off some dirt from around the edges and noticed a scratch on the side of the phone. Couldn't believe my eyes since I knew there was no damage before I put on the case and couldn't figure out where it came from. 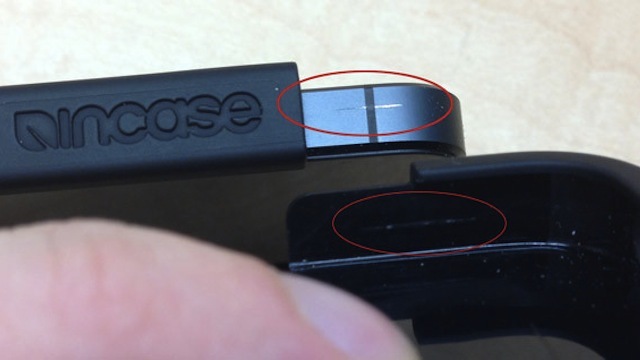 Closely inspecting the case from the inside, I noticed that one inside part had a piece of plastic sticking out. It corresponds with the scratch on my phone. Seems like it was a defect in the case which actually ended up scratching the phone." He could always keep it in the case and pretend like it never happened, or simply take a Sharpie and colour it in. The only problem is that he will always know in his mind that the scratch is there. Sadly Incase will most likely not replace the phone as the warranty states that they are not responsible for damage to your property while using their products.Good Apple build quality!